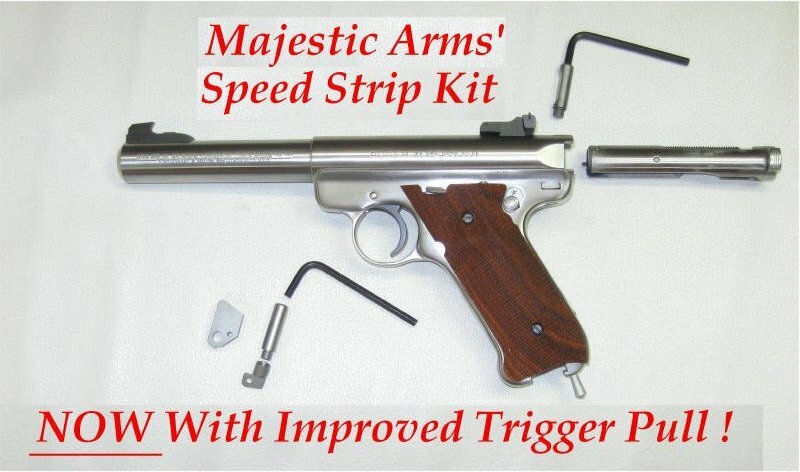 These Speed Strip conversion kits from Majestic Arms make dis-assembly of your Ruger Mk .22 Pistol easy and quick. No more busted fingernails and frustration with the original factory dis-assembly process. With the Speed Strip Kit installed, dis-assembly is a simple process to unscrew the bolt stop pin and remove the bolt. See an excellent video demonstration on our Speed Strip Demo Page. 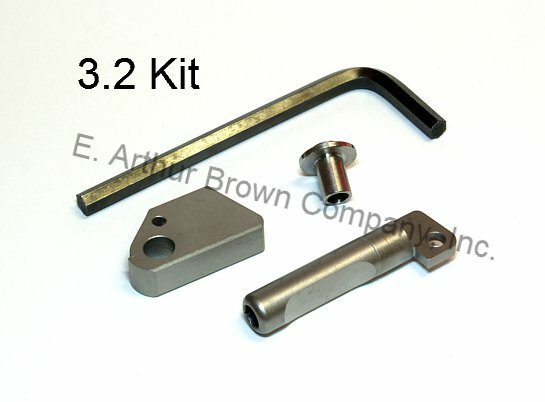 If you have a Ruger Mk I, Mk II, or Mk II 22/45, get the "Original" Kit or the "Fits All 3.2 Upgrade" Kit for improvements in trigger performance. What is the "Magazine Disconnect"? This is a politically mandated feature on Mk III and Mk III 22/45 pistols where the gun cannot fire if the magazine is removed. It's not a popular feature because it makes for a poor trigger pull and it makes magazines drag when you want them to eject. Many people remove the Magazine Disconnect feature by converting their Mk III back to the Mk II trigger bushing. Which Kit Should You Buy? The Fits All 3.2 Conversion works with all three generations ( Ruger Mk I, II, III, and 22/45) converts all to the preferred generation Mk II trigger, and removes the magazine disconnect from MK III (includes a Mk II hammer bushing)... This is the most popular kit. 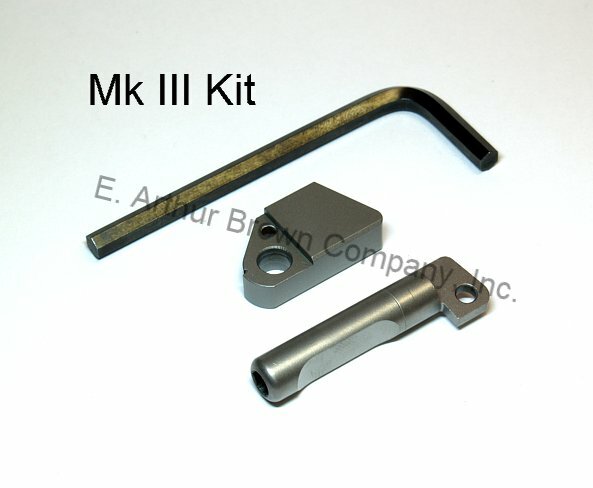 We also have the Original Mk I/II and Basic Mk III kits but these do not include the Speed Strip Mk II hammer bushing. Product arrived quickly and in good condition. Haven't had a chance to install yet, but will update when I get to use it. worked as advertised. really like the product and was easy to install. installation video was a big help. The upgrade is relatively easy for a gunsmith to install. Field stripping and bolt cleaning is a breeze. HOWEVER, it does not replace complete internal cleaning of the gun. You will still have to disassemble in Mk III fashion and continue to deal with that design disaster. Great kit and easy to install. Makes stripping for cleaning a breeze, I no-longer have any excuses for not cleaning after range day! I don't know how I did it without the quick takedown addition to my mark II. I was frustrated trying to reassemble it, but no more. This part is worth its weight in gold. Be Very careful to prevent hammer pin from coming out to far, things can get tricky if it does. Take note of EVERYTHING for position/placement BEFORE you take it apart. This will help greatly as the video that Dino does for installation is greatly lacking. Still. product works like a charm once installed and I would highly recommend it to Ruger shooters. But I would do the 3.2 kit, doing away with the mag disconnect, if I were to do it again. Might upgrade to it anyway in the future. This kit produced by Majestic Arms, is absolutely top quality. The machining is quality, fit is excellent, Dino's videos walk you through the process. And yes, be prepared to have all the parts come out, it will happen but the video covers the installation. The removable pin avoids take down and reassembly of the Mark series, what a relief! So happy I did this. Would highly recommend. A very good upgrade for the cost of the kit. I purchased two speed strip kits, one for the MK III nad one for a MK II. 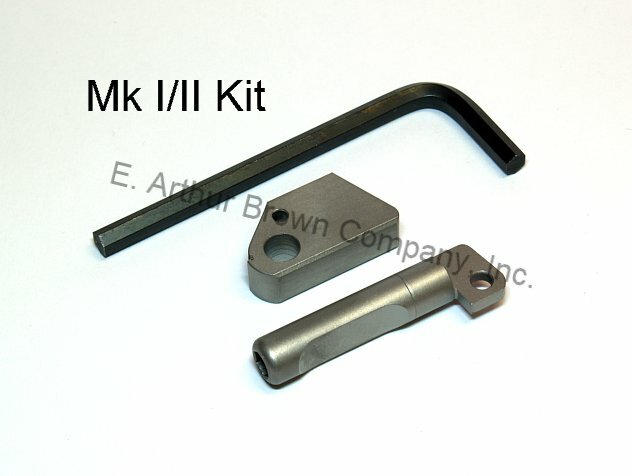 the MK III kit is $10.00 higher than the MK II but has more parts. I installed them as the video shows had no real problems. It does take longer to install the MK III kit, but when finished it is very well worth it. A very good upgrade for the cost of the kit, It included free shipping. Arrived sooner than expected. Had it installed and works well. Great quality and great online instructions. Took me about 1 hour to install the speed strip and the upgrade kit. Great kit! I can recommend this for the MK II and MK III pistols. My only complaint is the instructions from Majestic Arms isn't the best. The parts fit well with only moderate amount of effort. I had a BOMAR that hung over the bolt and I had to swap it out for a Volquartsen unit, similar in profile and location to a standard Ruger target sight, as mine was too long. The speed strip kits are amazing. My Rugers are Mk II and the speed strip kits make cleaning a breeze. Would recommend to anyone who has a older Ruger. Great buy. I have Two (2) Ruger MK1's and purchased two speed strip kits for them. I was a little nervous installing the first one but I took my time and found it to be easy to install. The second one was a breeze. What a great item, makes the Ruger simple to take apart,clean and put back together. I already had a tandemkross barrel bushing, which removes the magazine disconnect and thought I already changed the hammer. I decided just to go with the speed strip without the part that removes the disconnect. I’ve done quite a bit of work on several other firearms and thought this would be pretty easy. I will say the pins that have to be removed from my gun were a bit tough. I was freely expressing my happiness and found out I do have quite a foul vocabulary. I will suggest that if you don’t have one of those handy blocks with holes in it, you should find a junk piece of wood you can drill a hole part way thru for helping push the pins out and thru. Also give a little oil to the pins before placing back in. They will go in easier. After putting the mainspring back in and trying to take the bolt out, I couldn’t get the bolt back in. Found out I didn’t actually replace the stock hammer, so ended up having to swap the hammer out with the one provided. The stock hammer has a straight edge on it, where the provided hammer has a slightly rounded edge that lets the bolt slide past easily. Thankfully the tandemkross bushing and new hammer fit perfectly together back in the gun. After getting everything back together everything worked great. I also didn’t do the step of filing down the recoil spring assembly. If you don’t, it’s a bit tough to get the bolt stop pin thru the bottom past the spring assembly, but if you push the spring forward a tiny bit with a punch or small screwdriver, it will slide past it pretty easily. Not filing the spring assembly doesn’t really affect takedown when removing the pin out the top of the pistol. The pin comes out easily and then installs back in easily. Also, don’t touch the trigger with the bolt out. If the hammer falls with the bolt out, you will have to take the mainspring out to get it back down. I accidentally pulled it out of habit with the old hammer in thinking the hammer was just up some and needed to fall back to allow the bolt to go in. Forgot I had spring tension on it. Probably not good to drop the hammer without the bolt in. After all was installed, takedown became extremely easy. I’m sure I will shoot this pistol more frequently. I dreaded cleaning this pistol before installing this product. I highly recommend this product. Great kit, would recommend it. Works like it says and takes all the pain and frustration out of taking the pistol apart and reassembly. You wont regret the purchase. Had a hard time installing it, but seems to work fine now. Disassembly and installation can be a daunting task. I ended up getting help from a gunsmith. But once it is installed, it worked great. Really speeds up and simplifies the cleaning accessibility. The kit worked as described and installed easily. Installation was harder than I thought. Had to see video a few times to get it right. Great product. Had to watch video to install but once done it is great. Actually like shooting my lite .22 again since cleaning is a breeze now. Ruger lost their minds with the original breakdown of this gun but this product makes it much better. This kit enables removal of the bolt and cleaning of the barrel without having to experience the "entertainment" during the reassembly the trigger spring :). I now have this kit installed on both my MK II and III! Great invention (and makes one wonder why Ruger didn't think of it in their original design...). Highly recommended to anyone wishing to avoid the painful torture of the infamous trigger spring reassembly process on the Ruger MK I, II and III. Wish I would have discovered this invention sooner! Whoever thought of this was a freaking genius!!!! Now I can practice with my MKIII 22/45 and not go through all the BULL$H#T involved in just running a brush through the barrel to get rid of fouling from un-burned powder. I'll be putting a lot more rounds downrange. THANK YOU!!! THANK YOU!!! THANK YOU!!!! Easy installation. Makes the bolt removal a simple operation. Will be buying another for a older Mark II I've had laying around. Trigger is a hair smoother . Kit works as advertised. I had some trouble installing, so I followed the on-line video, and it went easier. Now the Mark III is as easy to clean as my S&W Victory. Very happy with my purchase.It was well worth the effort to install this kit, and the Majestic firing pin. Very pleased with my E.A. Brown experience. Price and value are good and service is exceptional. I have made other puchases from EAB in the past and have been pleased with every one of them. A good company to deal with. The Strip Kit for the Mark II Ruger pistols. Quality was superb. The kits went in and after learning the Ruger Dance the install was complete, now the pistols strip out easily for much needed cleaning from the breech. The speed strip kit works as advertized. It went together fine. I am not a gunsmith and I was able to install it. Only problem was re-assembling the original gun parts into the backstrap of the gun. It was difficult, and neither the instructions nor the video were helpful. Instructions need more detail, and the video needs to spend more time on this step. Once I got those parts back in, the gun functions normally. Kit may have made a slight improvement in the trigger, but not enough to buy it just for that reason. Gun functions fine after kit installation. I look forward to the first dissassembly with the kit installed. The Rugers should have come this way from day one. Pretty easy installation. Makes the bolt removal a simple operation. In order to go any further in the pistol breakdown, it is necessary to go old school and pull the factory disassembly mechanism. The only problem I had with this upgrade was trying to follow the instructions. I'm sure the instructions are fine, but it was the first time I ever had my 22/45 apart, so that was probably a contributing factor. Other than that the kit does what it's supposed to do. I am very satisfied with the speed strip kit. The mag doesn't hang for you to have to pull out now, but falls out like a 1911.The trigger pull is now very smooth and crisp, but the most important part is now after an afternoon of plinking I don,t have to use a paperclip to break it down, I now use the allen wrench provided for a good cleaning. Thanks for making my Mark 3 into an almost mark 4. Ruger 22/45. Great pistol, a bugger to put back together after cleaning. Run a can and the pistol gets pretty messy. This kit makes my life and cleaning a lot easier. The only problem, which is not much of a problem, is I kept the Volquartsen hammer. Per the directions, I have to use a small tool, screwdriver, pencil, whatever, to reach in and push down the hammer to allow the bolt to enter. Great product that solves a historical problem. Read the instructions, watch the video, then do the instal. You may soon have a pile of stamped metal parts that have a suspiciously gun related appearance, now scattered on your kitchen table. The Ruger Mark pistols are a delight until you have to deal with disassembly, then you realize old Bill was just plain nuts. This widget, if you have a friend who can reassemble your pile o' parts- it improves any Ruger's cleaning process. Good stuff. I had some trouble and made a telephone call. This call help and it was suggested if I had other problems to watch the video. Witch I did and my problems were solved. Great product. Purchased for my Mk II and III target pistols. Makes cleaning and lubing the bolt and receiver easier, and reassembly is so much simpler then the original Ruger way. I was sorely disappointed in the trigger of my new 22/45 Lite after hearing good things about them. This rep probably comes from the Mk I & II since the Mk III has a mag disconnect that reportedly messes up the trigger action. It was a long, hard pull with no predictable break and I had to pull the mags out. I got this and it totally transformed the trigger to a clean 3.5lb pull and the mags drop free. The fact that is makes the gun easier to take down is a great help too. Highly recommend. Ruger shouldn't ship a gun that needs this that bad, but they do. The kit works as advertised, and was far easier to install than I expected. A great investment that I wish I had bought sooner. Enclosed instructions were not as detailed as needed. Suggest watching 'YouTube' video along with instructions. Parts went together nicely and works great. Installed the kit, went to the range and tested the pistol, no problems trigger seemed a little better but did not have a gage to do a real comparison, gun was much easier to take apart and clean. Their were some tricky installation points and the guy in the video goes a little too fast at one particular important point. I am pleased with the purchase. Bought this as the last upgrade to my 22/45. I have a lot of Timberlake and Volquartsen in the gun already. I installed it then took it out. First of all, the allen head pin is too short to use effectively in a Volquartsen upper. Second, it requires you to replace the hammer, which is a tough job and loses you (in my case) a nicely honed hammer in exchange for theirs which is not. Lastly, I saw no advantage as far as stripping the gun. Using the speed strip was not faster or easier than stripping the gun down using the stock parts, for me. Your experience may be different. I've thought a lot about it, considering what it would be like if this was the only improvement I had bought, but really, bottom line, I think it's an almost good idea. If you own a Ruger and clean it frequently this is a must have!!!! I recommend before installing go to you tube and review installation process. It is not difficult if you have right tools. It is really slick once installed. Unable to use until sometime next Spring as the Mark 1 is up North and I will not be going back up there until it thaws in the Spring. This is the single best improvement that can be added to a Ruger MK III or the MK III 22-45. Easy to disassemble and clean and reassemble, and the trigger is so smoothe! This kit also removes the Magazine safety, if you can really call it that, which removes a lot of binding that helps with the trigger pull greatly. Installing the speed strip alone is a great improvement but the hammer and hammer bushing make this kit the best! I bought this product to assist me in cleaning my Ruger pistol. It works great for a very easy strip down. The only problem I had was the direction for install said I needed a gunsmith to install it. I didn't realize that but the gunsmith said the product was sensational. Quick and Easy Dis-assembly | Improved Trigger & Magazine Performance No Ruger Mark Pistol shooter should be without this Kit. The Speed Strip conversion kits from Majestic Arms makes dis-assembly of your Ruger Mk .22 Pistol easy and quick. No more tipping the pistol up, down, pull trigger and get everything to line up, dis-assembly is a simple process to unscrew the bolt stop pin and remove the bolt, YEP that easy. This is a must and has made cleaning my Mark 22's easy and quick with no complicated moves. These kits are amazing! Easy to install--a real person (the guy who makes them) answers if you have a question. Both my Mark III's can now be cleaned without doing the Ruger hold it up; hold it down; etc. dance! Just what the doctor ordered. I dreaded pulling my Ruger 22/45 apart to clean it. Not that it is particularly difficult, but that it was such a hassle. The Speed Strip kit makes it easy and fast. Get this kit it's well worth the money in time saved pulling down your pistol just to do routine cleaning. This is the third strip kit that I have installed and I will install more if I buy more Ruger pistols. The hardest part is putting the spring back in. You have to remember to adjust the hammer. It sure makes cleaning much easier though. Speed strip kit is well made and works great. Had no problem installing and I'm not a gunsmith. Eabco is a great company to do business with. I did Ruger Mk III Target Pistol. It's harder than it looks. The pin for Sear came out and then the sear. If you put in the instruction to put scotch tape on the pin to keep it from falling out it would help. Great kid otherwise. Now the gun is easy to clean. I recived my speed strip kit for my Ruger 22/45 mkIII. Great product easy install Directions are clear and easy to follow. Works very well Thanks Dino. This is the single best investment to improve the Ruger Mark II pistol ever. No more time wasted trying to get it together after a cleaning. The speed strip went in with no problems in just a few minutesI also put in the trigger conversion kit at the same time. They were right, dont totally remove the cross pin. When I took mine loose, it slid all the way out on its own.Parts came out, others moved. After trial and error and a few cuss words, three hands got it back together. Works great and has good trigger pull. This is a high quality piece of kit. well made and works as promised. It will not work with the JP Dove mounted site. There is a very small nubbin on the JP red dot that prevents the bar from exiting the receiver. Best modification for the MK III. Makes cleaning a non issue and I love the lighter trigger pull. I've shot a 1000 rounds since the modification was done and no issues. I got this kit mainly for the 3.2 conversion and magazine disconnect override. I'm very happy in both regards. To be honest, the Speed Strip part of the kit is a little bit more difficult to install than the OEM dis-assembly system, BUT, once it's on, it makes life much easier. EABCO price is very competitive, too. Bought kits for my MK III and 22/45 and both function exactly as advertised. The kits not only make disassembly and reassembly much easier, they provide the bonus benefit of eliminating the annoying magazine disconnect feature and make the trigger action just a little smoother. I'm totally pleased with my purchase.